Pre-sale orders for the 2014 FirstEnergy Mid-American Conference Men’s and Women’s Basketball Tournament are being taken at the UT Athletic Ticket Office or by calling 419.530.GOLD (4653). The tournament will be held from Wednesday, March 12, through Saturday, March 15, at Quicken Loans Arena in Cleveland. Tickets can be ordered at the following prices for each session: $10 for women’s basketball and $34 for men’s basketball. The same tickets purchased at Quicken Loans will be $13 for women’s sessions and $56 for men’s sessions. UT students will purchase tickets at Quicken Loans on game day by going to the UT table set up in the concourse. Students must show their Rocket ID — one ID per student, one ticket per ID. Tickets are $5 for women’s basketball sessions and $10 for men’s basketball sessions. The supply of UT student tickets is limited. The 5-12 seeds will play first round games on campus sites Monday, March 10, with the winners advancing to face each other in the second round at Quicken Loans Arena. The second-round winners will advance to the quarterfinal games to play the No. 3 and No. 4 seeds, with those winners advancing to the semifinal games to play the No. 1 and No. 2 seeds. The seeding is based on conference winning percentage, regardless of division. For complete tournament information, go to MAC Tournament Central. After having the post vacant for several months, the University has filled a position that plays a critical role in attracting corporate and foundation support and funding for research and other University initiatives. Brett Loney, UT’s new director of corporate and foundation relations, joins the University from St. John’s Jesuit, where he led its advancement office. 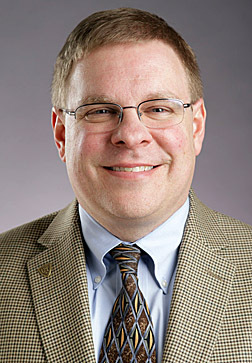 Prior to that, he held a similar role to his UT position at Wright State University. Loney said his office also can help in the receipt of funding once a request is granted. “Most corporations want to give this funding to a nonprofit — in this case, the UT Foundation. It’s my goal to make the logistics of the funding process as seamless as possible for faculty and researchers,” he said. Vern Snyder, vice president for institutional advancement, said it is important for the campus to know the position was filled. “Brett has more than 15 years of successful nonprofit development experience, and we want to make sure researchers out there know he can help increase the chances of successfully funding a research project,” Snyder said. Loney has spent his first several weeks at UT getting out and meeting deans, faculty and researchers, and he emphasized the continued close relationship his position has with Dr. William Messer, vice president for research, and the Office of Research and Sponsored Programs. While many of the state and federal governmental agencies that provide external funding are focused on science, medicine and health care, Loney pointed out that philanthropic support from foundations and corporations covers a much broader array of disciplines. “By working closely with the research office and coordinating our requests to foundations and corporations, we have a real opportunity to expand funding opportunities,” he said. The University of Toledo’s Four Seasons Bistro on Health Science Campus will make the switch to Pepsi beginning Monday, March 3. The Four Seasons Bistro in UT Medical Center will offer Diet Pepsi, Pepsi Max, Diet Mountain Dew and Diet Sierra Mist, among other brand favorites. The contract between Coca-Cola and UTMC expired in December. “Pepsi is excited to be featured on the Health Science Campus, and we are excited for the consistency across our campuses,” said Joy Seifert, director of auxiliary services. Vending machines on Health Science Campus will continue to offer Coca-Cola products, but also will feature Pepsi products. The priority deadline to complete the FAFSA is fast-approaching. Steve Schissler, UT assistant vice president and director of financial aid and enrollment services, reminds students that Saturday, March 1, is the priority deadline to submit the Free Application for Student Aid, known as the FAFSA. The form is completed annually by current and prospective students to determine their eligibility for federal financial aid and is needed to apply for most state and college aid. Students who complete the FAFSA by the March 1 deadline will have a better chance to receive the aid they qualify for, Schissler said. The FAFSA can and should be filed after March 1, but priority consideration will be given to students who apply by that date, he added. Rocket Solution Central is available on campus to answer financial aid questions, and tips for completing the FAFSA are featured on its website, utoledo.edu/rsc. To file your FAFSA, go to fafsa.gov. The University of Toledo Athletic Department announced that bleacher seats for the remaining men’s and women’s basketball games will be available for $6. Bleacher seating is normally reserved for UT students, but with spring break March 3-7, those seats will be available for sale to the general public. Bleachers are located at floor level in either end zone. The UT men host Western Michigan Saturday, March 1, at 6 p.m. in a game that will have a big impact on the West Division crown of the Mid-American Conference, as well as for the seeding of the MAC Tournament. Toledo (23-5, 11-4 MAC) is tied with Buffalo (17-8, 11-4 MAC) for the second-best record in the league, one game behind leader Western Michigan (19-8, 12-3 MAC). The teams with the top two records in the league get byes until the semifinal round. Toledo could still receive the No. 1 seed in the tournament by defeating WMU Saturday and also by winning its final two contests next week at Central Michigan Tuesday, March 4, and vs. Eastern Michigan in the home finale Saturday, March, 8 at 2 p.m. The Rockets also have a chance to tie the school record for most wins in a season, set in the 1939-40 season when UT went 24-6 under Coach Harold Anderson. The UT women will host West Division leader Central Michigan (17-9, 13-1 MAC) Sunday, March 2, at 2 p.m. Fans can take advantage of the Kids Zone before the game from 12:30 to 2 p.m. Children can check out inflatable bounce houses as well as other activities in the Fetterman gymnasium in Savage Arena. Toledo (13-12, 8-6 MAC) plays at Northern Illinois (8-16, 4-10 MAC) tonight. Coach Tricia Cullop’s team also will host Eastern Michigan Wednesday, March 5, and will finish the regular season at Ball State Saturday, March 8. Tickets for all home games can be purchased in advance or at the door. Call 419.530.GOLD (4653) for more information. 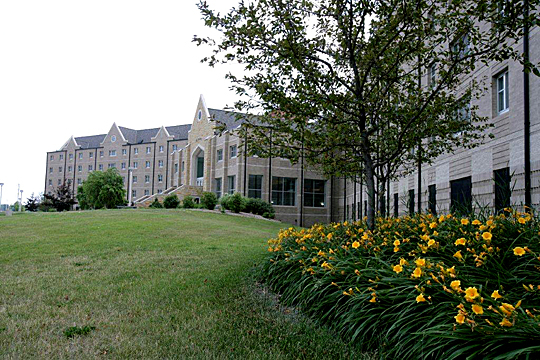 The University of Toledo will host a renaming ceremony Friday, Feb. 28, for Presidents Hall, formerly known as the Crossings. “The ceremony is an opportunity to honor our past presidents and to bring the community together,” Virginia Speight, UT director of residence life, said. Presidents Hall, located in the southwest corner of UT Main Campus, honors four past presidents with each wing bearing the name of a former University leader — third President John Worthington Dowd, seventh President Philip Curtis Nash, eighth President Wilbur Wallace White and 15th President Daniel M. Johnson. With the removal of Dowd, Nash and White halls last year, the University wanted to find a way to continue to recognize leaders who helped shape the institution, Speight said. The ceremony will be at 1 p.m. in the second-floor lounge area of the residence hall followed by a reception on the first floor. The dedication will be led by Dr. Kaye Patten Wallace, senior vice president for the student experience, and will include remarks by UT President Lloyd Jacobs, UT Board of Trustees Chair Joseph Zerbey and Johnson, who served as UT president from 2001 to 2006. Rosalinda Santiz-Diaz, an indigenous artisan who is working to establish equality for women in Chiapas, Mexico, will be the keynote speaker for Women’s History Month at The University of Toledo. She will discuss “Walking in Women’s Land: Indigenous Women’s Rights in Chiapas, Mexico” Monday, March 10, at 3:30 p.m. in Student Union Room 2592. A gifted weaver, Santiz-Diaz is president of the Center for Women’s Training and Development at K’inal Antzetik (Land of Women) in Chiapas. Founded in 1992, the non-government organization brought together indigenous women to pool their skills to increase their income and role in community development. Now the Chiapas chapter also provides sexual health and reproductive rights education, literacy programs, and leadership development for women. “We demand a life with justice and dignity without any violence … today we give you the colors of our work to join your dances and songs, fights and reclaims of a better life,” Santiz-Diaz said her address to the World Court of Women Against War in South Africa. 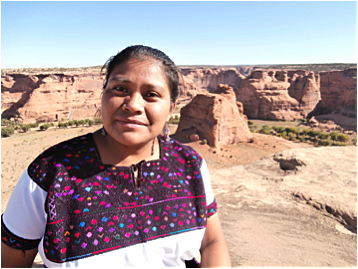 She led the Mayan women’s weaving cooperative known as Jolom Mayaetik, which was the initial focus of K’inal Antzetik. The two organizations are meeting the United Nations Millennium Development goals of addressing extreme poverty and hunger, empowering women and girls, promoting gender equality and economic development, improving maternal health, reducing maternal and infant mortality, and promoting women’s reproductive health. “K’inal Antzetik addresses ending economic, military, political and domestic violence against women, building capacity for indigenous women and communities while preserving Mayan culture,” Lea McChesney, UT visiting assistant professor of anthropology, said. Following Santiz-Diaz’s talk, there will be a reception and market at 5 p.m. Weaving created by indigenous women of Chiapas and sold through Jolom Mayaetik will be available for purchase; all funds will benefit these indigenous organizations. For more information on the free, public program, call the UT Department of Women and Gender Studies at 419.530.2233. The University of Toledo will designate a permanently unoccupied seat in Savage Arena in honor of military service personnel who were or are prisoners of war (POW) or have been declared missing in action (MIA). A dedication ceremony will take place during the first timeout of the men’s basketball game vs. Western Michigan Saturday, March 1. Tipoff for the game is 6 p.m. Participating in the ceremony will be Mike O’Brien, UT vice president and athletic director; Dr. Dennis Lettman, dean of the UT College of Adult and Lifelong Learning; and Petty Officer 2nd Class Matt Kelsey, an active-duty Navy corpsman and UT student. The location of the seat will be floor level, across from the visitor’s bench. The seat will be fixed to a mobile platform, which will allow it to be moved into position for every game. The seat will serve as a constant reminder of the more than 83,000 unaccounted service members since World War II. 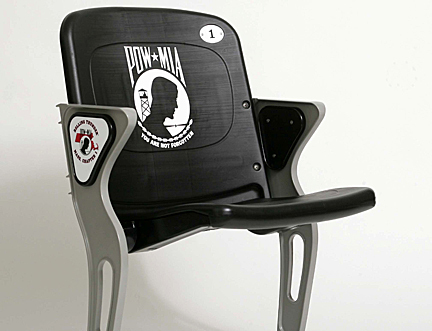 The University of Toledo previously designated a POW/MIA seat in the Glass Bowl last fall. UT was the first university in the country to dedicate an honorary seat for POW/MIAs. In addition, UT will honor Stephen Machinski and James Dickman, the Toledo firefighters who were killed in the line of duty Jan. 26, with a moment of silence prior to the game. The national anthem will be sung by Dan Desmond, vice president of Toledo Firefighters Local 92, and his son, Devon. Nominations are being accepted for the Edith Rathbun Outreach and Engagement Excellence Award. Take a few minutes to recognize a deserving colleague who has distinguished himself or herself through exceptional community outreach and excellence in community-engaged scholarship, whether in research, teaching or professional service. Each recipient of the Edith Rathbun Outreach and Engagement Excellence Award will receive a $750 award. Two awardees will be chosen. The Rathbun Excellence Award was endowed through a generous and growing gift from Edith Rathbun and further gifts from campus and community donors. It recognizes outstanding outreach and engagement scholarship in any field, discipline or area at The University of Toledo. Full-time faculty members in all colleges are eligible to receive the award. Friday, March 14, is the deadline to submit nominations. The one-page nomination form is available online here. The selection committee is composed of faculty members who served on the Scholarship of Engagement subcommittee of UT’s former Council on Outreach and Engagement. Honorees will be recognized at the annual UT Outstanding Awards Reception Monday, April 21, at 6 p.m. in the Student Union Ingman Room. For more information, contact Penny Thiessen in the Office of Research and Innovation at penny.thiessen@utoledo.edu or 419.530.6171. The University of Toledo’s Savage Arena will host the 2014 Division I NCAA Women’s Basketball First and Second Rounds Saturday, March 22, and Monday, March 24. Games for session one Saturday will be played at 11 a.m. and 1:30 p.m. The session two game Monday will be played at 6:30 p.m.
An all-session ticket package includes tickets to all three games. Purchase a 2014 Division I NCAA Women’s Basketball Championship all-session ticket for the first and second rounds and receive a free ticket to either the UT women’s game vs. Central Michigan Sunday, March 2, or their contest vs. Eastern Michigan Wednesday, March 5. All sales for the 2014 Division I NCAA Women’s Basketball First and Second Rounds are final; there will be no refunds or exchanges. To purchase tickets, go to utrockets.com. Participating teams will be determined Monday, March 17, at 7 p.m. on the ESPN Selection Show. For more information, call the UT Ticket Office at 419.530.GOLD (4653).